Upgrade your watch collection today. Here you have a new Apple Watch Series 1 38mm in Silver. Old one was faulty and taken to Apple and they replaced it with this new one. It is the Watch face only. No charger, straps or any other accessories. Has not been used at all. Still has the plastic wrapper on it. Happy Bidding! Apple Watch 42mm 316L Stainless Steel Case (A1554) with 3rd party Milanese loop. This is a good condition 1st Generation Apple Watch 42mm 316L Stainless Steel with a 3rd party Apple Watch Milanese Loop. 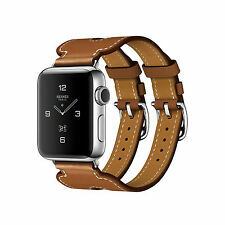 apple iwatch series 1 42mm. 7 extra straps. Red yellow green blue purple sport grey olive green. Condition is Used. Dispatched with Royal Mail 1st Class. The watch has been tested and is in excellent working order. There are a few very minor scratches on the screen and body of the phone due to general use. Immaculate condition Series 0 Apple Watch - 42mm. 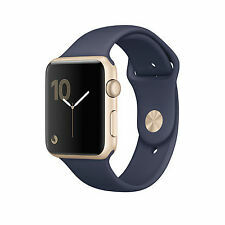 Apple Watch Sport 7000 42mm Gold Aluminium Case Midnight Blue Sport Band -. Condition is Used. Complete with original box and extra wrist ban piece. (Apple Watch 38mm Series 3 Nike (SOLD AS SEEN IN PICTURES). In AS IMMACULATE CONDITION ALL AROUND. Kind regards :) Listed. This is an Apple Watch Series 2 38mm. It is Silver with White strap. It is used but we are very geeky about are gadgets. Apple Watch, Series 7000 42mm for sale in rose gold. 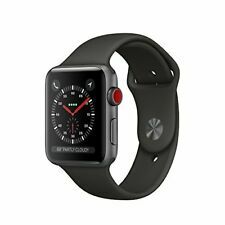 Apple Watch Series 3 38mm Space Grey Aluminium Case with Black Sport Band (GPS), hardly used, less than a year oldand excellent condition, works perfectly only selling as bought new Samsung phone. Includes box and charger. Condition is Used. this is a first generation apple watch in great condition for a used item. low reserve for such a nice watch. Apple Watch 38mm Series 7000 for sale in space grey. Apple Watch Series 1 Space Grey Black Sport Band. In good working condition. Apple Pay works really well on this! I hardly have to take out my wallet anymore. I’m selling due to upgrade. Note in the picture , I have included a plug from my iPad , I’ve misplaced my Apple Watch plug and have been charging using the iPad which works perfectly fine. Alternatively , you can just charge it by plugging into a USB port. Full working order. Ready to link to your iPhone. 5 out of 5 stars - Apple Watch Series 1 42mm Gold Aluminium Case black Sport Band - (MP032B/A used. 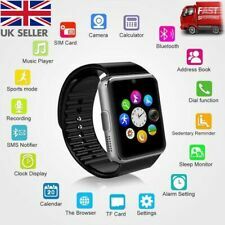 158 product ratings158 product ratings - Apple Watch Series 1 42mm Gold Aluminium Case black Sport Band - (MP032B/A used. Apple Watch Series 1 38mm Space Grey Aluminium Case Rose Sport Band - Boxed. Condition is Used. Dispatched with Royal Mail 2nd Class. Apple Watch Series 2 38mm Rose Gold Aluminium Case Pink Sand Sport Band - Condition is Used. Dispatched with Royal Mail 1st Class Large Letter. The watch still works, there is a few scratches on the screen. Apple Watch Series 3 38mm Stainless Steel Case with Milanese Loop (GPS .... Condition is Used. Dispatched with Royal Mail 1st Class. Apple iwatch Series 3 Nike GPS. Was bought at as a Xmas present only worn a handful of time if that, prefer my old traditional watch. Excellent condition comes full boxed and at restored to factory default settings. Bought last August (2018) so just 9 months old, genuine Apple Watch Series 3 Nike sports watch 42mm with genuine Apple black strap (not original nylon weave Loop). Apple Watch Series 2 38MM. Product Title. Important Information. Apple Watch Nike 38mm Space Grey Aluminium Case Black/Volt Sport Band - (MP082…. Condition is Used. Selling as upgrading model, great watch, hard-wearing and reliable. Has been in regular use the two years I have had it, so naturally has some scuffs and scratches from everyday use. In good working order. Comes boxed with charging cable. 99p starting bid, no reserve! Auction only. Please no offers. Happy bidding! P er fe ct condition on ly 1 2 mo nt hs o ld. Apple Watch Edition White Ceramic Series 2 42 mm CrmWh Cloud Sp MNPQ2B/A. unwanted gift! excellent condition really like new! 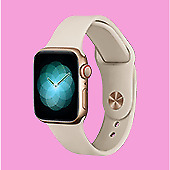 You are bidding on a Official Apple Watch Series 1 38mm Rose Gold Aluminium Case with Pink Sand Sport Band. The watch does have some minor wear/scratches on the screen but as you can see from the photos it is only noticeable when looking very closely in certain lighting. Otherwise the item functions perfectly and comes complete with box, instructions, charger and spare Medium/Large band. The item will be posted 1st Class Recorded Delivery. Any questions please ask. Thanks for looking. This is a 1st gen apple watch which is in good working order. There are some light scratches on it but nothing serious or the affects the way it works. In the box is the charger and a couple of straps. Condition is Used. Dispatched with Royal Mail 1st Class. Please do not bid if you live outside the uk as I will not post internationally. Apple Watch Series 2 42mm Space Grey - Worn For A Week And Cracked The Screen! The Apple Watch is Apple's answer to the ever-growing smartwatch market. With an innovative design, advanced features and unique customisations, the Apple Watch Series 4 is an advanced device packed with handy features. This watch is ideal for fitness fanatics. Built-in GPS, a heart rate sensor and the ability to go up to 50 metres underwater make this smartwatch is the ultimate companion for an active lifestyle. Choose a 40mm Apple Watch Series 4 for a smaller, sleeker device, or go for a 44mm Apple Watch 4 for something with added screen space. Building on the previous models, the Series 4 is an elegant yet highly functional device. Slimmer borders clear the way for added screen space with curved corners offering more touchscreen area on the watch face. Even though the screen is 30 percent larger than previous models, you still get 18 hours of battery life in one charge. You can choose up to eight different metrics to display on the watch face, including heart rate, oxygen quality and the time, perfect for keeping an eye on vital stats when on the go. An updated Digital Crown copies the style of analogue watches, offering realistic haptic feedback when turned. Various features and apps work hand in hand to track your health, like an optical heart rate sensor. This tracks your heartbeat throughout the day, and you can also set up low or high heart rate alerts, notifying you of changes in your heartbeat when you're inactive. Use other apps to keep on top of your health. Breathe takes you through breathing exercises to help you relax and Lifesum tracks your exercise and diet. This Apple Watch can be used during intense workouts to keep track of your performance. Whether you're running, swimming or practising yoga, there's something for everybody.